A woman onboard a Delta flight in the USA has been arrested after trying to open the airline door in mid-flight. The passenger was subdued by fellow passengers until the plane was able to land at its destination. 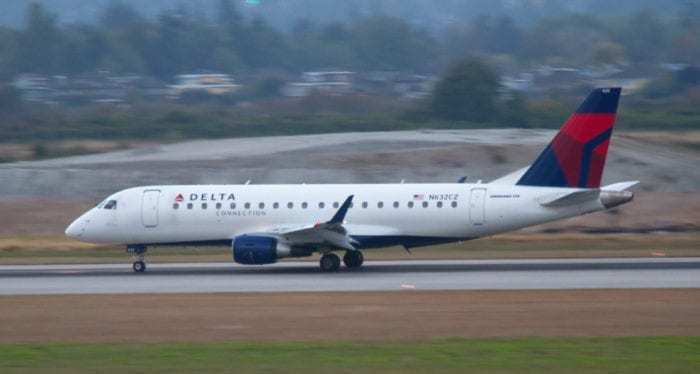 Delta flight 5972 was inbound from Indianapolis to Detroit on Monday, when a woman stood up from her seat and proceeded to try and open the sealed plane door. The aircraft in question is an Embraer E-170. Upon noticing this, she was pulled back by fellow passengers and returned to her seat under supervision. The plane then landed without incident. “As of now, it appears she did not have any criminal intent and instead may be suffering from a medical issue. However, this is based on preliminary reports,” – Detroit Airport Authority. When the plane landed at Detroit, the passenger was arrested and the case forwarded to the FBI. It is believed that the passenger was attempting to open the door due to a medical condition, and all charges have been dropped. What happens if you try to open the doors mid-flight? The short version of this answer is; you can’t open the door. The long version is that airplane doors, typically the ones found on pressurized jet aircraft, open in first then out, meaning you need to pull the door inwards to release the latch. Because the inside of a plane has a higher pressure than outside, it is almost impossible for someone to open the door against the pressure. In fact, if someone were strong enough (and the pressure weighs around that of five cars) they would rip the handle off long before the door opened. Not to mention that the doors themselves are actually ‘locked’ by the cockpit. But for the sake of entertainment, let us discuss what would happen if somehow the door was opened. First, the cabin would rapidly depressurize (assuming the plane is at around 30,000 feet). This would mean plenty of popped eardrums and nose bleeds, but nothing too serious. The air masks would deploy (with around 30 minutes of oxygen) and the plane would rock around until it found its new balance. The pilots, of course, would start an emergency descent to 10,000 feet to ensure breathable air and proper temperature. No passengers would be sucked out of the hole, but it would be very noisy and windy. The plane would still fly perfectly fine. Of course, we’re not aircraft engineers, so invite anyone with more knowledge to feel free to leave a comment. What do you think? Would you try to open a door inflight?